Whether you're screening an applicant prior to employment or screening a current employee, the chore of informing that person about a failed background check can feel cruel. They likely have good intentions and, for all intents and purposes, may have been stellar candidates or solid employees. The good news is that you can prepare for this process with some forethought and you may not have to withdraw a job offer or terminate them after all. Here is a clear process to tell an employee that they failed their background check. What Does a Failed Background Check Look Like? Determining what results would fail a background check is one of the first decisions that you should make before screening. 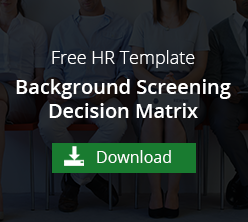 A background check screening policy and decision matrix will offer direction on what constitutes negative results. As an example, if the background check revealed moving violations, but driving isn't a part of the employee's job description, then that wouldn't necessarily constitute a failure. These policies will define which screens should be run in accordance with the job description and what screening results would disqualify them for the job. If you're working with a trusted professional background screening company or consumer reporting agency (CRA), they should offer a verification of the data returned from the screenings. The reason for the double check is to manually review the results to reduce the risk of false-positive matches and ensure accuracy. Illegible consent forms, outdated records, or other individuals with the same name could present information that may not be correct. Another way to verify the background check data is correct is to inform your employee. Through the Fair Credit Reporting Act (FCRA), they have the right to dispute false or inaccurate information on their background checks. They should be aware of these rights through the adverse action process. Unfortunately, humans make mistakes. Records from their teenage/young adult party days could still show up and affect someone's job opportunities. Or someone who's been working for your company for decades could suddenly slip up or fall into trouble due to family or life challenges. It's never fun to be the one to share bad news but you can prepare now for failures later. First things first - decide which jobs require certain background checks so you'll know what a failed background check looks like. Then handle the situation the way the law specifies.